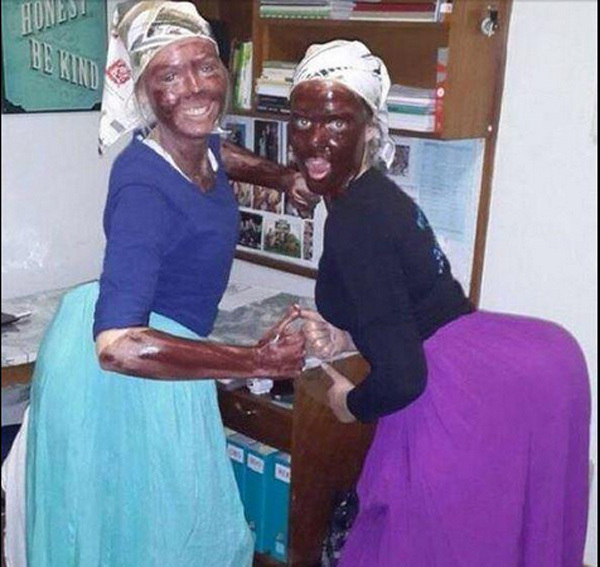 The University of Pretoria (UP) will be taking disciplinary action against two of its students after pictures surfaced of them dressed as black domestic workers. The images that surfaced on social media picture the two men with their faces painted brown, wearing domestic worker attire. The university’s Nicolize Mulder has said that UP would not tolerate any form of discrimination and racist behaviour by any of its staff or students and launched an immediate investigation on Tuesday after becoming aware of the photographs. “The behaviour by the students in the photographs is completely unacceptable,” said Mulder. It is understood that the students ‘dressed up’ for a private 21st birthday party. “Because the students are registered UP students who by their actions brought the name of the University into disrepute, disciplinary steps against the students will been taken,” said Mulder. The hashtag #blackfaces has since started trending on Twitter with many people weighing in on the situation. LOOOOLLL at Tuks #blackface students. About time some ignorant little shits got made an example of. Well played, UP. I'll wait for the twitter tribunal to pass the final verdict on the #blackface spat. I'm too emotional to enter the fray!